FDC party headquarters in Najjanakumbi are closed over a Shs4m debt. 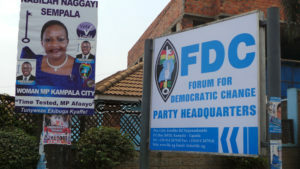 For the last four days, offices of Forum for Democratic Change (FDC), located at Najjanakumbi, a city suburb have been closed over a Shs4m debt. One Stephen Wafula closed himself inside, demanding party officials to pay him for the services he provided during the party’s delegates’ conference where members elected their new president. Wafula claims that he supplied stationary to the leading opposition party last month, but he has never been paid. Two sources, who are not authorised to speak for the party told PML Daily that Wafula might have entered the offices on Sunday afternoon, when employees were cleaning the premises. “He entered the treasurer’s office and locked himself there. I was not even a ware that we had a debt to clear because the former leadership never listed him among those we should clear,” a senior party official explained. To be safe, Wafula moved with some food and water to enable him. He insisted that he supplied party cards and fliers, to FDC, the party promised to pay him at the end of the conference. But up to now, I have never got any coin. I shall not leave this place until they pay,” Wafula vowed not to vacate. The deputy secretary general Harold Kaija refuted Wafula’s claims, saying that he is being used to divert the public from putting pressure on NRM Government not to temper with changing the Constitution. “Since the entire country is looking at how President is using Parliament to launch his life presidency project, the state wants to divert people by using people like Wafula,” he added. But his boss, Nandala Mafabi, the party secretary general was quick to admit that they have not cleared Wafula. He said they will process his payment. Though it is not officially revealed, multiple sources said FDC is facing a financial crisis after some MPs close to Gen. Mugisha Muntu, the former party leader stopped remitting their funds to run party activities. Partick Amuriat, the new party president defeated Muntu in a highly contested race, with some analysts warning that unless two groups are reconciled, the party is likely to lose its members. Muntu group is very bitter with Dr. Kizza Besigye, the founding president of the president, accusing of undermining Muntu leadership. And taking side, by supporting Amuriat. Besigye defended himself,saying its only Amuriat among the five candidates who invited him to attend his rallies. There is also growing fear that Muntu might form his own party, though he out ruled it assuring Amuriat that they will work together to build the party. Muntu however warned Amuriat to be careful working with intriguers.